The Paint Branch Farmers Market is over 30 years old and is one of the first farmers markets in the local area. The market now has several vendors providing goods including local produce, baked goods, flowers, and pottery. All products are locally grown or hand crafted to minimize transportation costs and provide support for local farmers and artisans. The farmers market brings fresh produce to College Park while also engaging the community in sustainable practices by allowing citizens to purchase their foods locally. 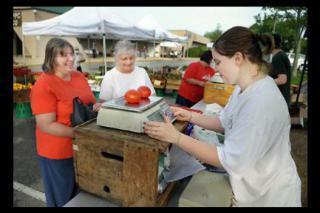 The market is open on Saturdays from 7:00AM-12:00PM starting in early May and closing at the end of October. The market is held in the parking lot of Herbert Wells Ice Rink/Ellen Linson Swimming Pool, only a short walk away from the College Park Metro Station.